With just days to go before a potentially historic Westminster general election, a further rise in support for the Scottish National Party is already creating a crisis in British politics which will likely have implications for Ireland. All but one or two of the 59 MPs elected by Scotland could now be won by the SNP by the time counting concludes on Friday, creating a political imperative for independence which is directly comparable to the 1918 ‘Sinn Fein’ election in the aftermath of the Easter Rising in Ireland. A confused Labour Party leader Ed Miliband told a television election special on Thursday that he would refuse any pact with the SNP -- even if it meant giving up the chance of power to David Cameron’s Tories. On Friday he repeated that there would be “no deals or coalitions”. Depending on the results of Thursday’s election, his stance means there would be no alternative to a second term under the current British government. According to current predictions, this would also require the support of unionist hardliners in the north of Ireland. The SNP leader Nicola Sturgeon warned that Miliband is “in denial” about Labour’s need to work with the Scottish National Party in a hung parliament -- not to mention the need to move towards Scottish independence. On the campaign trail, Ms Sturgeon said if Miliband tried to lead a minority government without doing deals with other parties, he would put the SNP in “a strong position to win changes and exert influence” on an issue-by-issue basis. In the north of Ireland, Peter Robinson’s DUP are attempting to increase their representation to shore up Tory losses and play ‘kingmaker’ in London. Commentators agree that their pact with their unionist rivals, the UUP, is likely to see them increase their representation at Westminster by at least one seat. However, Robinson is still struggling with a scandal over the extreme homophobic views of his party representatives. Despite the resignation this week of his Health Minister Jim Wells, the scandal could still undermine any negotiations with David Cameron. Sinn Fein has also been accused of hypocrisy after defending an election leaflet highlighting how Catholics outnumber Protestants in north Belfast. The party, which has dismissed unionist electoral pacts as a ‘sectarian headcount’, faced the same accusation over the leaflet promoting Gerry’s Kelly’s campaign. The flier includes a bar chart showing Catholic and Protestant populations in the constituency -- 46.94 per cent and 45.67 per cent, respectively -- and the message ‘Make the change’. Kelly was condemned by nationalists, unionists and republicans alike for the unusual focus on voters’ religion, a reminder of elections in the 70s. He defended the leaflet and the use of census figures to highlight “significant demographic change” in north Belfast. “These official statistics are used widely by individuals and organisations - academic, media and political - to predict future political and electoral trends,” he said. Sectarian tensions have been simmering over the campaign. Loyalists have been urged to remove election posters by the nationalist parties and “leave them on the ground”, in a message from the UDA-linked Ulster Political Research Group. In a Facebook post the North Antrim and Derry branch of the party, which provides “political advice” to the UDA, calls on loyalists to take down any Sinn Fein, SDLP or Alliance posters. And there have been two arson attack on roadside Sinn Fein election billboards. 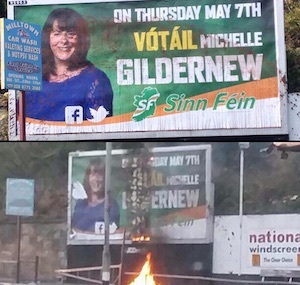 One billboard promoting candidate Gearoid O hEara in Derry was badly damaged when it was set on fire this week in an attack which mirrored one on a billboard featuring Michelle Gildernew in Dungannon, County Tyrone last month. Mr O hEara said the incident was not just an attack on his election campaign but an attack on the wider democratic process. “Posters and billboards from all political parties should be treated with respect,” he said. While Sinn Fein is aiming for gains in Derry, north Belfast and south Belfast, its greatest concern is in Fermanagh/South Tyrone, where Gildernew is defending a margin of just four votes. The popular candidate is warning nationalist voters that turnout will be key in her constituency, as it will be in many others. She said that unionism appeared to be mobilising in this year’s general election because the Orange Order is playing a key role in supporting the agreed unionist candidates, such as her opponents, Tom Elliott of the UUP. Fermanagh and South Tyrone usually has an exceptionally high turnout and the candidates and their parties recognise the significance of turning out voters for a successful outcome. “I think the turnout this time will be much higher on the unionist side because of the work that the Orange Order has been doing in terms of getting people registered, postal and proxy and all of that,” she warned. 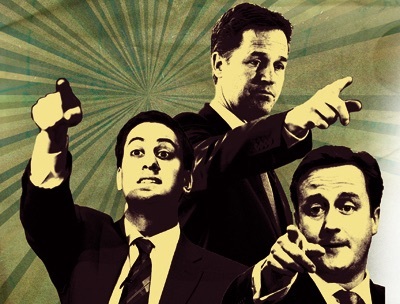 * Full election reports will be published here on Thursday and Friday as the results come in.